Candidates for Migori Senate seat by-election have intensified their campaigns ahead of the October 8 by-election, even as the shadow of Governor Okoth Obado diminishes in the race following the killing of university student Sharon Otieno. The contestants have resorted to door-to-door campaigns. Some have erected huge bill boards and banners in various parts of the county to sell their manifestos. Governor Obado, who has adversely been mentioned in the killing of Ms Otieno, had opposed ODM's move to hand a direct ticket to former Cabinet minister Ochillo Ayacko. The governor vowed to campaign against Mr Ayacko as he warmed up to Mr Dalmas Otieno who later withdrew his candidature and instead settled for an appointment to the Salaries and Remuneration Commission. Following the withdrawal of Mr Otieno from the race, Mr Obado shifted his support to businessman Eddy Oketch. Sources say the governor was willing to fund his campaigns to complicate matters for Mr Ayacko. Mr Obado had handed Mr Oketch's campaign team an open truck he had used for gubernatorial campaigns in last year's general election. His billboards in Migori Town are also said to have been funded by the governor. However, Ms Otieno's killing has distracted the governor from the race, as he has not been in the county for the past one week following the student's killing. Mr Oketch, who is running on Federal Party of Kenya, has exuded confidence that he will give Mr Ayacko a run for his money. The saga surrounding the killing of Ms Otieno, the Rongo University student whose body was found in K'odera forest in Homa Bay, has featured prominently in the campaigns. Political observers contend that the case is likely to influence the race. ODM has sent a team of elected leaders to lead grassroots campaigns for Mr Ayacko. The team comprises Migori Woman Representative Pamela Odhiambo, MPs Peter Masara (Suna West), Paul Abuor (Rongo), Tom Odege (Nyatike) and Mark Nyamita (Uriri). ODM chairman John Mbadi unveiled the team in South Kamagambo, Rongo. "We are determined to ensure ODM retains this seat through Mr Ochillo Ayacko. We will leave nothing to chance," Mr Mbadi said. The Orange team has embarked on holding town hall meetings in all the eight sub-counties as a campaign strategy. This week, the team visited Kuria West, Kuria East, Nyatike and Suna East. "I believe I have what it takes to represent your interests in the Senate. I tried in 2017 to run for the top job but you all know what happened. I am now determined to serve you in a different capacity. Please walk with us," Mr Ayacko told residents of Kuria. ODM leader Raila Odinga is expected in the county at the tail end of the campaigns to rally support for Mr Ayacko. Mr Ayacko is considered the front-runner after Mr Otieno withdrew from the race. since last week when incident occurred. 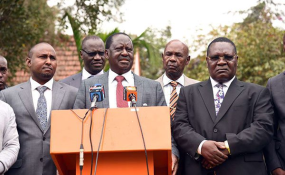 The ODM camp has been accused of using the case to disparage Mr Obado hoping to capitalise on the moral perception crisis that he is currently facing in a bid to neutralise his influence in the race. "We know some people have taken advantage of Sharon's case to pin down the governor for political expediency. We reject this political opportunism," Mr George Olumwa Kidikibudi, a political activist, said. He added: "We call upon the aspirants in the upcoming by-election to stop politicising Ms Otieno's murder and if they continue with what we are seeing, we shall be forced to come in." A source close to Mr Oketch told Nation that his camp has been dealt a big blow by Ms Otieno's murder. "It's true the incident is a major setback to our campaigns because Mr Obado will now concentrate on clearing his name and it's also true he has lost some moral ground," an ally of Mr Oketch, who asked to remain anonymous, said. "We were really banking on his massive grassroots networks and of course his deep pockets," he added. The seat fell vacant following the death of Mr Ben Oluoch Okello who succumbed to the throat cancer at a Nairobi hospital. Apart from Sharon's murder, the Kuria community is likely to play a role in who will win the seat. The region, which has close to 87,000 votes, supports Jubilee Party. However, given that Jubilee has not fielded a candidate, the region's votes are open to any candidate who manages to convince the residents. Though Mr Solomon Hodo of People's Democratic Party hails from Kuria West, his Luhyia ancestry has denied him an outright command of the region's votes. Other candidates for the seat include businessman Mr Jobando Peter (Green Congress Party of Kenya), Mr Ogolla Dickson Ogolla (Independent) and Mr Otieno Samwel Otieno (Independent).